We are thrilled to have you join us at the Dryhead Ranch for an authentic cowboy working ranch vacation. 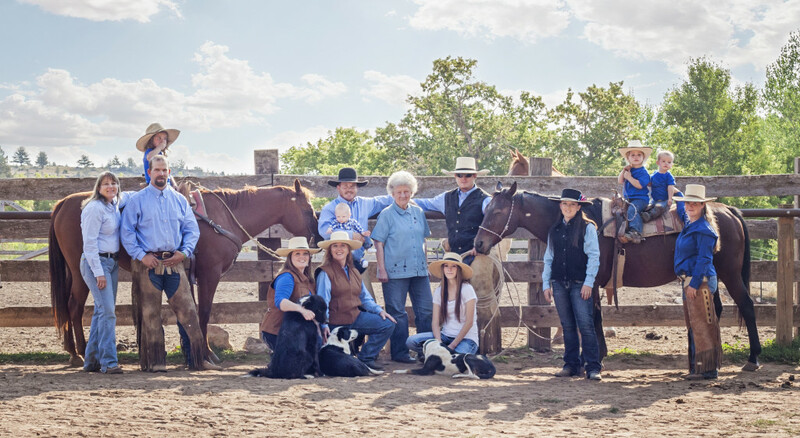 During the week that you ride at the ranch with us you will experience a wide variety of activities: working cattle, gathering cattle, cattle drives, working horses, horse drives, branding calves, mending fences, and our cowboys and cowgirls will teach you to rope. We offer the best horseback riding vacations in Montana. We are real, remote, quiet, and have seemingly endless mountain vistas. We share with you real cattle work and real working cow horses to experience an amazing horseback riding vacation. Saturday we will return you to Billings. En route we will visit several of the historic sites along the Big Horn Recreation Area: Lockhart Historic Ranch, Devils Canyon Overlook, and the Wild Mustang Museum. The Dryhead Ranch is located on the Crow Indian Reservation and features one of the largest historic buffalo jumps in the United States. We also have a few Indian Pictographs on the canyon walls and lots of arrowheads and artifacts for the finding. We are required to honor a Federal alcohol-free ruling required on all reservation properties. April 12-18, 2020 Horse Drive from Wyoming winter pastures to Montana Ranch. April 17-18, 2020 Real Ranch Horse Sale – Billings, Montana. May 31-June 6, 2020 Gathering mares and adding stallions for the breeding season. October 11-17, 2020 Registration of weanling colts, putting mares out for the winter. October 25-31, 2020 Horse drive to Wyoming. April 26-May 2, 2020 Trailing cows and calves to Montana Ranch from Wyoming pastures. (These drives pass through the Big Horn Canyon Recreational Area, Horse Thief Canyon, Wild Horse Range, Big Horn Canyon Overlook, Lockhart Lane and into Dryhead Territory). May 3-9, 2020 Trailing cows and calves to Montana Ranch from Wyoming pastures. May 10-16, 2020 Trailing cows and calves to Montana Ranch from Wyoming pastures. May 17-23, 2020 Trailing cows and calves to Montana Ranch from Wyoming pastures. Sept 20-26, 2020 Gather to bring to the corral Jeff’s cattle to sort, wean, and haul to Wyoming. Pregnancy test and reride pastures to find any cows and calves we have missed. Sept. 27-Oct. 3, 2020 Gather Matt’s cattle to sort, wean and haul to Wyoming. Reride pastures to find any cows and calves we have missed. Oct. 4-10, 2020 Gather Jen’s cows and wean calves and haul them to Wyoming. Oct. 18-24, 2020 Ranch Week. Getting cattle on final pasture for fall. Looking for missed calves. May 24-30, 2020 Branding, doctoring calves, gathering into the trap to brand. June 7-13, 2020 Branding week. Gathering to trap to brand. June 14-20, 2020 Branding calves returning pairs to mountain pastures. June 16-22, 2020 Finish up branding and take cows to distant pastures. June 21-27, 2020 Checking horses and doctoring calves and fixing fence of our ranch. June 28-July 4, 2020 Moving cows to summer pasture. July 5-11, 2020 Closed over the 4th of July. July 12-18, 2020 Working with young horses. Moving cows to summer pasture. July 19-25, 2020 Rotating summer grazing pastures. Working with young horses. July 26-Aug. 1, 2020 Checking cows, calves and horses. Removing stud horses out of mare bands. August 2-8, 2020 Pushing cows and calves back up on mountain pastures. Halter breaking colts. August 9-15, 2020 Checking pastures. Doctoring heifers. Outside riding. August 16-22, 2020 Riding southern pastures check heifers and mare bands. August 23-29, 2020 Pushing cows and calves back up on higher mountain pastures for grazing. Aug.30-Sept.5, 2020 Riding outside pastures looking for our cattle. Getting ready to wean. Sept. 6-12, 2020 Moving cows from back side. Pre-weaning shots. Sept. 13-19, 2020 Moving cows close to ranch. Sorting off neighbor cattle. Getting ready to wean. A deposit of $500 per person is required upon booking to hold a reservation. It is non-refundable if cancelled less than 90 days before vacation date. Balance is due 30 days prior to arrival and is nonrefundable thereafter. Dates can be changed with emergency situations. All payments should be in US dollars. They can be cash, personal check (with approval), Visa. Mastercard or bank wire. There is a 3% charge on use of a credit card. We suggest a 15% gratuity. If additional days are desired, we can make special arrangements by email or phone. There is a transfer charge of $100.00 per person for pickup in Billings on the day of your arrival to come to the ranch and we return you to Billings on the following Saturday by noon. We have three places we pick up on the Sunday of your arrival: Best Western Clock Tower Inn and Dude Ranchers Lodge and the Billings airport. If you choose to stay at another hotel, please make arrangements to meet us at the airport at 4:00, at Door Four at the west end of the airport. Our phone number 1-307-272-6688. Please send us travel arrangements 30 days in advance of arrival even if you are using a booking agent. We won’t know where to pick you up if we don’t receive your travel plans, airline information, pick up arrangements and driving plans. Please remember to send them when they are final. Thanks. Dryhead Ranch has a small ranch store that we make available to our guests because we are a long ways from town if something is forgotten. We have cowboy hats, chinks, western vests that our cowboys wear, sweatshirts, T-shirts, gift items of horsehair jewelery and basic personal toiletitries. Check the website for a list of “THINGS TO BRING”. Always consider the weather. Layers are good anytime of year. There are two types of accommodations you can choose: the bunkhouse rooms or three separate, private cabins with bathroom. The cabins are available for $300 per couple and $200 per single person, per week. Our semi-private bunkhouse rooms have two shared bathrooms and each private room has a queen bed, or twin beds to accommodate families or groups. The bunkhouse rooms are included in the weekly cost of our cowboy vacation. Ask when booking for what fits your needs. Dryhead Ranch reserves the right to alter or change any attractions, dates or activities, due to unforeseen circumstances and weather. However, substitutions of a similar kind will be arranged. These circumstances would include: unfavorable weather conditions, range or pasture conditions, insufficient bookings. Special arrangements and discounts are available for returns, families or groups. These arrangements are best made by phone. Office phone is 1-307-548-6688 or the Iris’s cell phone is 1-307-272-6688. Yellowstone National Park, Big Horn Mountains Historic Medicine Wheel, Custer Battle Field, Wind River Canyon, Thermopolis Hot Springs, Big Horn Canyon, and Wild Horse Range. Beartooth Pass and Chief Joseph Highway going into or out of Yellowstone National Park. Guests can fly into Cody, Wyoming and rent a car and access Yellowstone National Park more conveniently. Cody is also a great western, cowboy town that offers a nightly rodeo from Memorial Day weekend to Labor Day weekend.